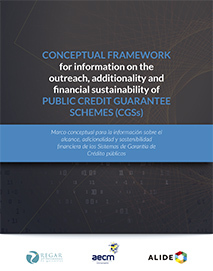 This document lays the basis for formulating a conceptual framework of the information for the Credit Guarantee Schemes (CGS). The mission of the CGS is to provide credit to entrepreneurs who are not being assisted due to the lack of quality guarantees and to ensure this credit flows in the best conditions. The concept of financial additionality is the raison d ‘ être for the CGS. The document identifies the economic effect resulting from mitigating market failure. This effect can be measured in the beneficiary entities (economic additionality) and the local economy (macro-economic impact). 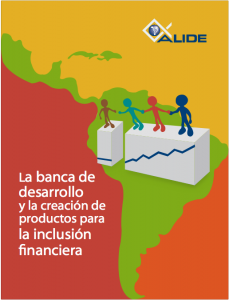 This book commemorating the 50th anniversary of the Latin American Association of Development Financing Institutions (ALIDE) is intended to serve as a source of reference for understanding the world of Latin American and Caribbean development banking. 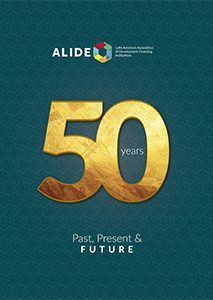 It is organized around three levels of analysis: the past, the present, and the future, and on that basis, a full picture is given of ALIDE and its member institutions in the context of the economic and social growth of the region’s countries. 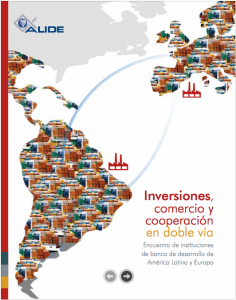 The technical document describes and analyzes the situation of the international commerce and the Latin American and the Caribbean. It has been compiled in the book “Solutions for Resilient Trade Finance Infrastructure”, financed by Export-Import Bank of India and presented in the annual meeting of Development Financing Institutions in Asia and the PAcific (Adfiap) in 2018. The book describes the projects that won the ALIDE Awards, initiatives that may be replicable by peer institutions from other countries in the region. In this sense, the publication of this book, whose degree of detail allows to fully understand the performance of the projects, constitutes a useful instrument for transmitting knowledge. 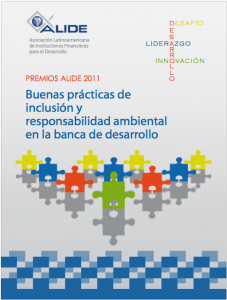 The book describes the programs that were awarded ALIDE 2016 Prizes due to their scope, innovativeness and contribution to the economic and social development of several of the region’s different sectors. The hallmark of the four programs covered in the book is their valuable contribution to social and financial inclusion in their respective countries of operation. As such, their publication in the book offers other institutions an opportunity to familiarize themselves with their content and to replicate them, thereby contributing to those areas of development. 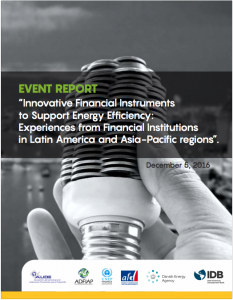 The content of this publication was generated from the Event “Innovative Financial Instruments to Support Energy Efficiency: Experiences from Financial Institutions in Latin America and Asia-Pacific regions” held November 15 & 16, 2016 in Lima, Peru at ALIDE headquarters in collaboration with AFD, UNEP-FI and ADFIAP. 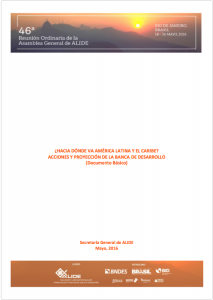 The opinions expressed in this publication are those of the coauthors presenters and participants and do not necessarily reflect the views of the Inter-American Development Bank, its Board of Directors, or the countries they represent. 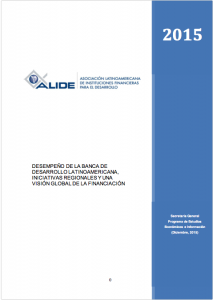 This document for the Inter American Development Bank (IADB), made public with ALIDE as IADB strategic partner, analyzes the decisive role financing has played in building the consensus that led to Paris Agreements, the result of the Conference of the Parties (COP21), that was adopted by 195 countries on December 12, 2015. This document highlights that the Agreement starts a process of transformation and innovation in the world economy to mitigate climate change and to diminish its effects. The document consists of six parts: In the first, there is a brief introduction of the main events in the region in the recent years of economic peak, indicators and achievements. In the second, the economic performance of Latin America and the Caribbean in the past three years and its current situation. In the third, there is an analysis of the information on the main regional and multilateral bodies on the outlook of the world economy, and the main factors which may jeopardize its recovery. The fourth highlight the main megatrends that will have huge implications on the business world and the economy and that in a way define strategic action lines to show the way to the countries and their institutions, including developing banks. 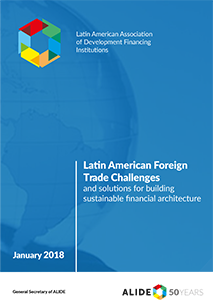 The study analyzes the main characteristics of the operating and financial situation and performance of development financial institutions (DFI) from Latin American and the Caribbean; the institutional changes these entities are going through, as well as the national initiatives that strengthen their role and their field of action to support, in better conditions, the development of their respective countries. 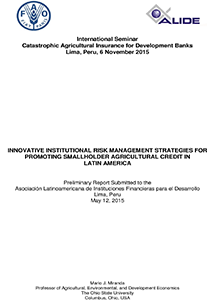 Asociación Latinoamericana de Instituciones Financieras para el Desarrollo by Mario J. Miranda, Professor of Agricultural, Environmental, and Development Economics, The Ohio State University Columbus, Ohio, USA. 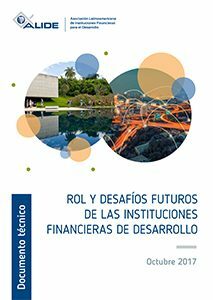 This publication collects the results of the “V Encounter of Development Banks from Latin America and the European Union”, held in Madrid, Spain, organized by ALIDE and Instituto de Crédito Oficial (ICO), from Spain. 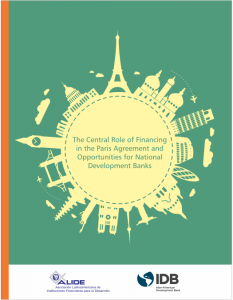 This publication will become an important reference for development banks, rulers, and policy-makers responsible for the design and implementation of public policies for financing development, academics and researchers, and any person interested in the function performed by national development banks, in order to promote the joint financing of projects and investment initiatives of mutual interest for stakeholders in both regions, contributing in this way to strengthen economic ties. 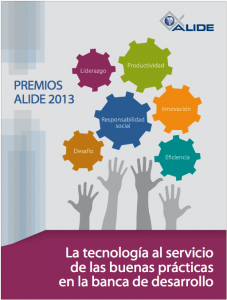 The book presents and develops the entire process of formation and implementation of the five projects that, by their innovative character, won the ALIDE Awards 2014. In addition, offers an approach to the results of these initiatives, mainly concentrated in the areas of impact social and environmental, they have had on their respective societies. These projects are: 1. Emerging Scheme to support natural disasters and economic recovery, Nafinsa, Mexico; 2. operacionais Partnerships: uma à solução for family agriculture or finance, for BRDE, Brazil; 3. 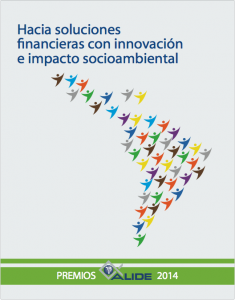 Technology for Social Impact Project, Findeter, Colombia; 4. Financial Inclusion of Small Business, for Sebrae, Brazil; and 5. Financing Program-Green Renewable Energy Project Finance, BICE, Argentina. In recent years, despite Latin America and the Caribbean (LAC) significant financial progress, there are still significant shortfalls and gaps to close. 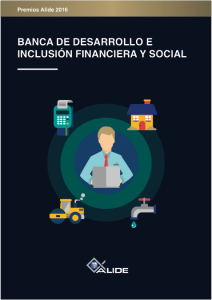 There are some cases of low levels of inclusion and of financial banking and yet innovative experiences are to promote the participation of more population segments in the financial sector are also observed. 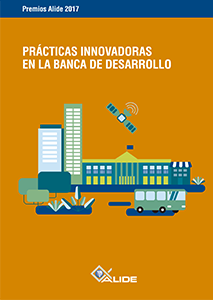 The book showcases these initiatives in order to promote their replication in countries where it is necessary to promote financial inclusion policies. 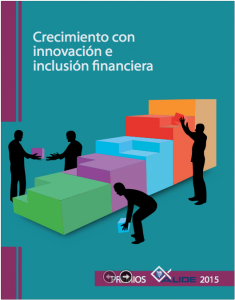 The book includes detailed information on the programs that were recognized by ALIDE 2013 Awards thanks to the efforts to promote financial inclusion and the use of technology and innovation in the processes of Latin American development banks. These programs are: 1) Export and Import International Factoring, by Banco Nacional de Comercio Exterior (Bancomext), Mexico; 2) Metodologia de avaliacao de empresas (MAE), by Banco Nacional de Desenvolvimento Econômico e Social (BNDES), Brazil, 3) Experts: digital communication strategy, of Nacional Financiera (Nafinsa), Mexico, 4) Sustainable and competitive cities, Financiera de Desarrollo Territorial (Findeter), Colombia, and finally 5) Cofigas, of Corporación Financiera de Desarrollo (Cofide), Peru. It gathers the conferences of the Seminar for Development Bankers, which was held on March 26, 2011 and was organized by ALIDE and the Business Development Bank of Canada (BDC) – the latter is a qualified organism and affiliated member of ALIDE-, on the occasion of the Annual Meeting of the Board of Governors of the Inter-American Development Bank (BID), that was held in Calgary city, Canada. In this last meeting was shown the direction that should be followed or tends to be followed by development banks in terms of financing, in relation to the trends observed around the world and which enshrine the direction through which development bank must operate, and determines its course of action. Moreover, important aspects such as relationship with the national governments, their performance evaluation, the corporate government, transparency and accountability were discussed. It gathers the conferences of the Seminar for Development Bankers, which was held on March 26, 2011 and was organized by ALIDE and the Business Development Bank of Canada (BDC) – the latter is a qualified organism and affiliated member of ALIDE-, on the occasion of the Annual Meeting of the Board of Governors of the Inter-American Development Bank (BID), that was held in Calgary city, Canada. In this last meeting was shown the direction that should be followed or tends to be followed by development banks in terms of financing, in relation to the trends observed around the world and which enshrine the direction through which development bank must operate, and determines its course of action. 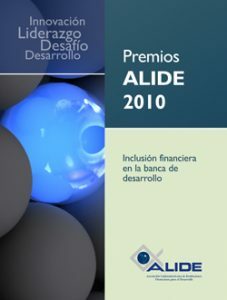 In this announcement, the winners of 2011 ALIDE awards are presented. 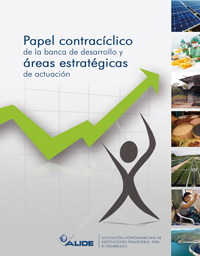 They are: RENOVA (Restoration program of number of vehicles), of the CFN (National Financial Corporation) of Ecuador, which purpose is to improve the efficiency of the public spending in the transport sector; the Program of Financial and Technological Support to organic Coffee, of the FIRA (Agricultural Trust Funds), of the Banco de México, which gives credit to organizations of small organic producers and to the basis of the productive chain, and provides training and technical assistance. 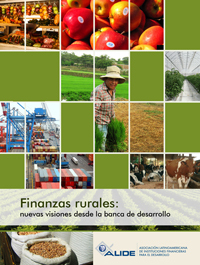 The book gathers the lectures and comments presented during the Latin American Meeting on Agricultural and Rural Financing: “New trend in agricultural banking”, carried out at the beginning of 2010 in Mexico. The topics that were thoroughly discussed in the meeting and are compiled in this book to offer valuable and current information for development financing stakeholders include: What innovations should be included in agricultural financing? How did the crisis affected this quite vulnerable sector, and what did the development banking to rescue it? Why is it necessary for development banking to promote the use of new instruments and more technology in agricultural processes, and the creation of rural financial intermediaries’ networks? 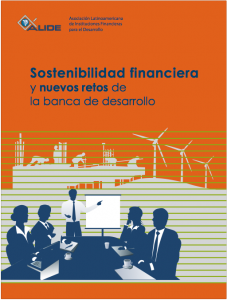 The book shows the role of DFI as agents of financial public policies, and describes where the development banking is going, as well as the measures and actions to be taken to comply with its social mandate and help to solve the great problems faced by Latin America and the Caribbean such as poverty, inequality, lack of safety, exports and production based on natural resources, the backlog in infrastructure, the low quality of education, the weak support to technological development and climatic change. 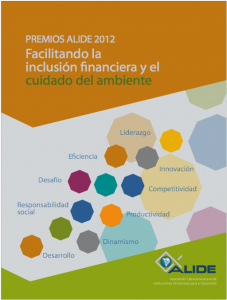 ALIDE book emphasizes financial inclusion initiatives, recognized by the ALIDE Awards 2010: “Amazon Fund” (category Green ALIDE), from BNDES, of Brazil, for their contribution to decrease the emissions produced by deforestation of Amazon forests. The Best Financial Product was the Contribution Fund for Social Infrastructure (Fondo de Aportaciones para la Infraestructura Social) (FAIS) from the Mexican Banobras. Its objective was to improve the access to banking services to less developed municipalities. In the category Information, Technical Assistance and Social Responsibility, the two most important programs were: “Social, Cultural and Business Spaces”; from Brazilian Banco do Nordeste, that support social and cultural inclusion and entrepreneurship, and the “SME Windows” from Banco de la Nación of Perú, to provide SMEs in poor areas a better access to financial services.